Early finishers…I don’t recall being taught about them in college but the struggle of what exactly to have them work on is REAL. When I first started teaching, I would just have them read if they finished something early. Seemed easy enough. But some students don’t enjoy reading (*gasp* I know) and I didn’t want them to hate it more by having to do it every spare second. Plus, then they’d have no incentive to actually finish their work. I definitely wanted reading to be a CHOICE for those that love it but I needed other options for those that didn’t. 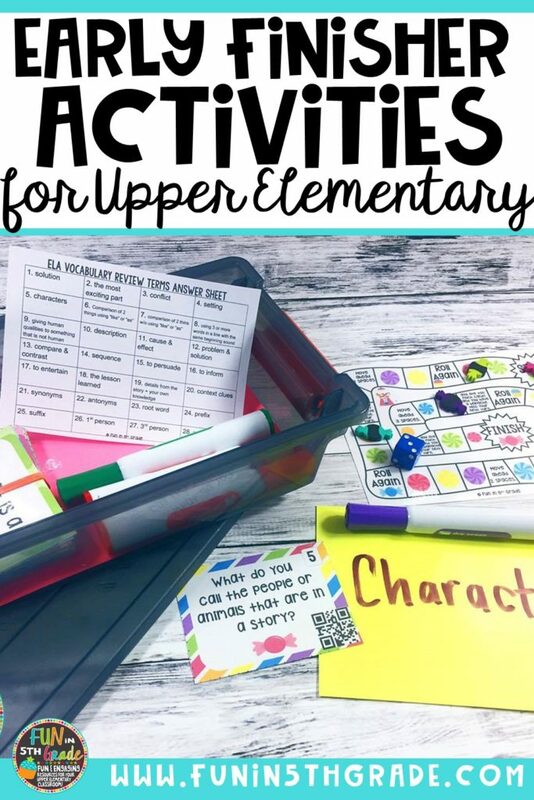 Then came the the other issue of making the activities “too fun” that students rushed through their work to be able to get to them. Not ideal. This can be a real problem. But, I also didn’t want the options to be viewed as punishments either just so people didn’t rush. So, in order to get the the activities, they had to have best effort work. I looked over it BEFORE they were allowed to partake in the other choice activities. If there were a lot corrections to be made, I don’t tell them which ones. They need to go back over it and find the mistakes themselves. This helped get them to put out their best work the first time. I definitely didn’t want them coming up to me to figure out what they needed to do every time they finished something. So, after a few weeks into the school year we did an anchor chart together with ideas for what they could do when they finish their work. Some students pick the same activity every time. If you have this problem, here is one solution I used. I really would prefer them to have a little bit of a variety in their activities so I added their options on choice boards. That way they could still pick the ones they enjoy more but they have to choose a different one each time. They can’t do a repeat until they get a new board, which I would hand out to students that have filled a certain number of spaces. We sat together and discussed possible options for what activities would be good choices for early finishers. We also discussed what kind of work they needed to have in order to be able to get to those choice activities. I wrote all ideas down on an anchor chart. Here are the options we have come up with over the years. Some years, they may have more options for early finishers than other years depending on the class. Also, some options may get taken away if they do not following the expectations (which we go over A LOT) of that particular option. 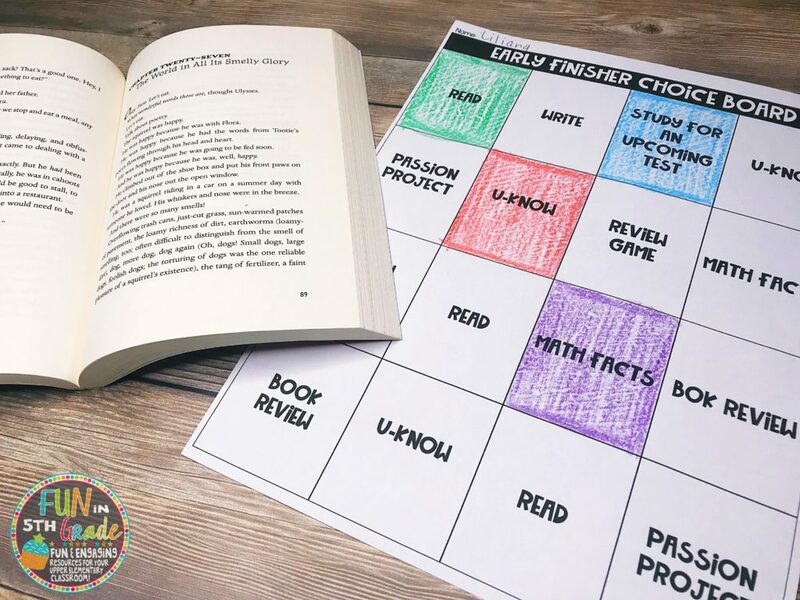 I then put the choices on the choice board and they are able to choose and then color their choice each time they finish early. Get the FREE DOWNLOAD here. This one is priority number one! If they have other work that they haven’t finished, they must work on and finish that before they can move to any other choice activities. Reading is always an option. I know some students that will pick this every single time. It’s a great, quick way to fill some time before the next activity. Writing is always an option. They can write in their notebooks anytime they finish something early. This is choice writing time. If they love to write this is a good option for them to be able to choose the topic and go to town! We don’t have a lot of tech but I do have a few Kindles with some math fact apps on them. They can grab one and practice quietly at their seats. I also have a Multiplication Fact U-Know game that my students LOVE to use to practice. It also comes in all of the other operations. 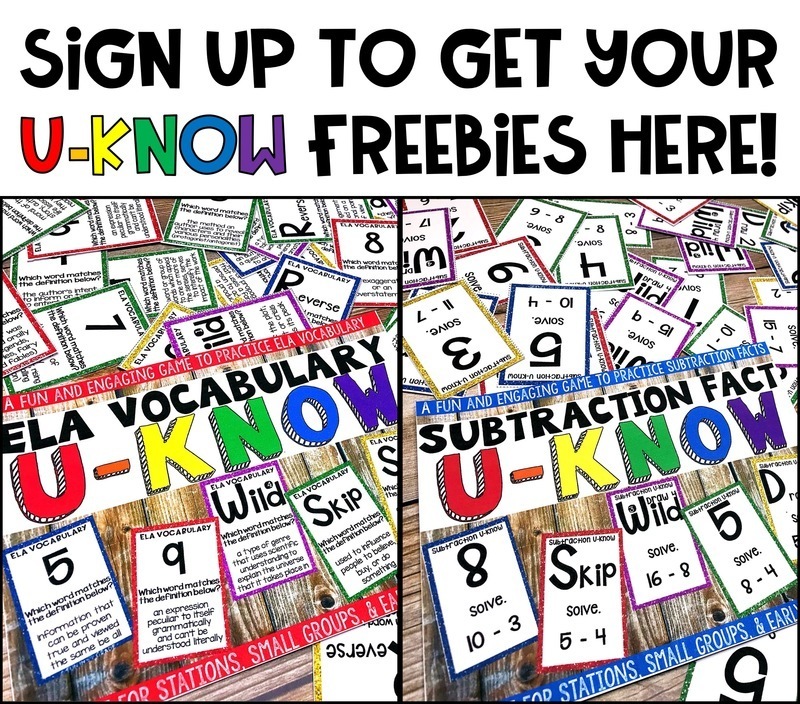 You can even get the subtraction version to try for free by signing up for my newsletter by clicking here. 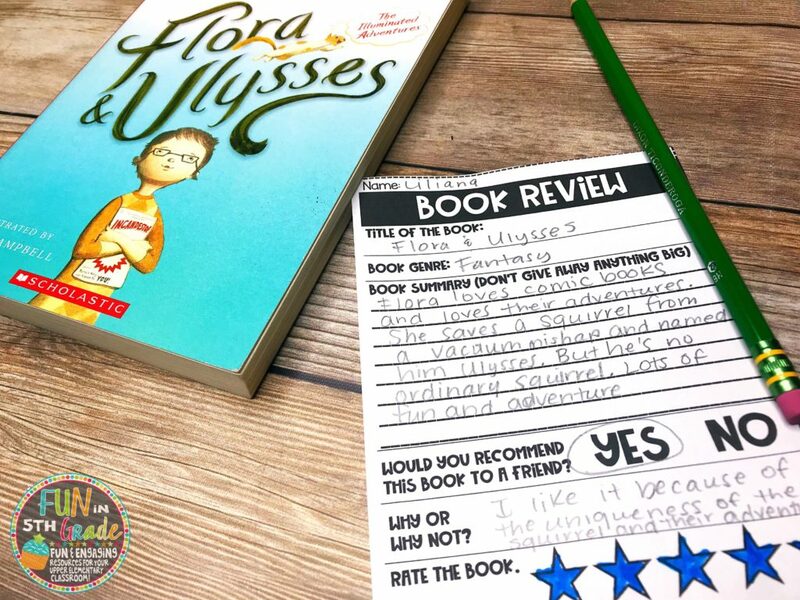 Students who have just finished a book they love, have the option of writing a review for the book and putting it inside the front cover of the book for future readers. I fins that students are more likely to read a book one of their classmates recommend. Plus, it’s a great way to let other know what a great book it is and why. I made a quick freebie for you to be able to use this. Download the freebie here. 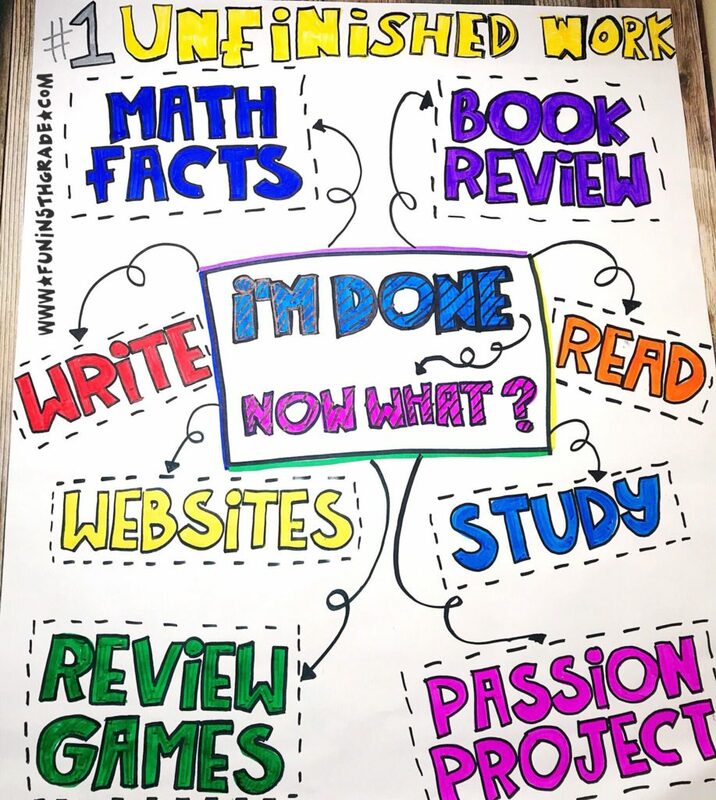 Spelling, vocabulary, math, science, social studies…there is usually a quiz or test coming up that they can study for. They can make their study cards, study with a friend, or study at their seats. It’s a great option to get students in the habit of studying before the assessment. 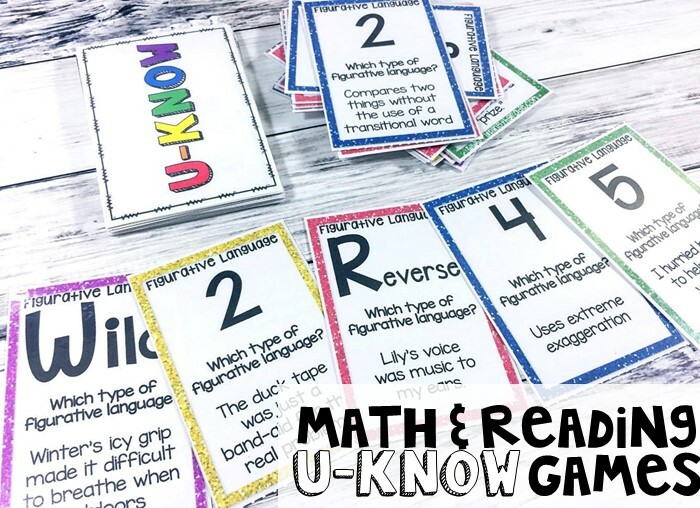 I usually always have a few U-Know games ready to go for students to practice with a friend or two. 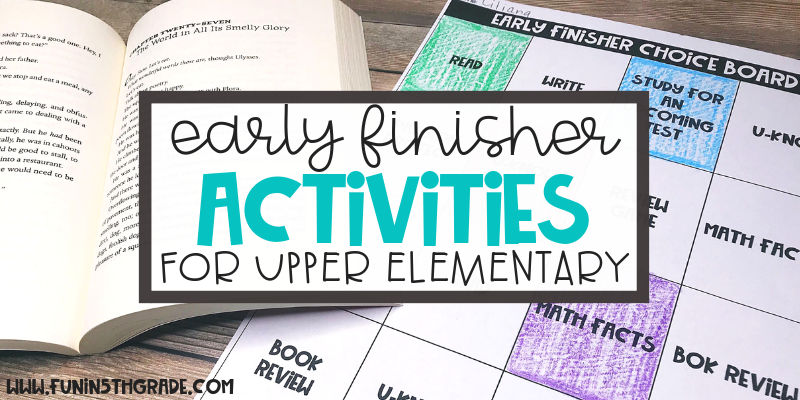 These early finisher games are usually topics that have passed that I’d like to keep fresh in their minds or they are prerequisite skills for upcoming chapters that they had the previous year. It’s a great way to spiral the standards throughout the year so students don’t forget important concepts. 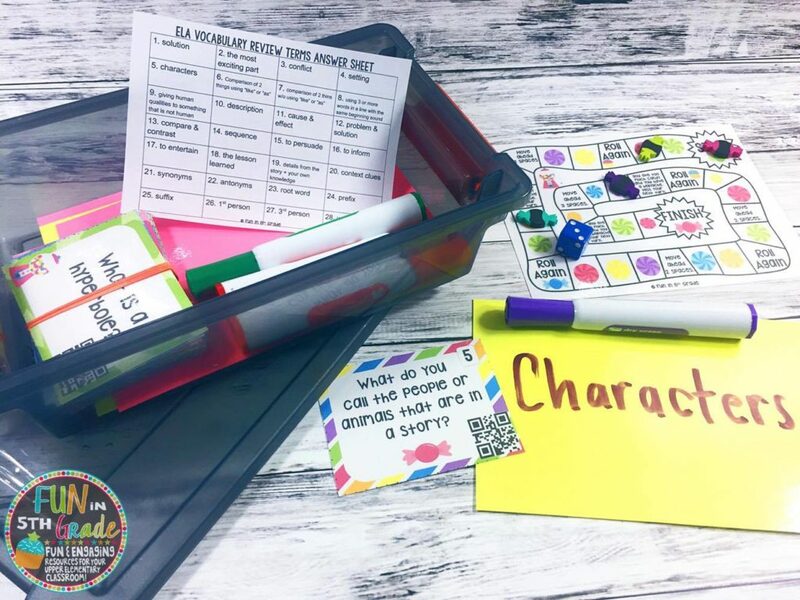 See more about how I spiral the standards using games in this post. My students always really enjoy their Passion Projects. There’s no set due date and they get to choose something they are passionate about to do them on. So it’s a great activity to pull out and work on whenever they get a chance. Once they’re done, they get to present the information that they learned to the class to teach us more about their passion. I personally LOVE seeing these presentations and the students BEG for time to work on them. Sometimes I will take a skill that they need extra practice on and make a mini set of task cards to put into a container. You can see how I do that in this post. I add mini white board, markers, erasers, game pieces and a die. I also include a mini answer key. Students can grab a friend and a bin and get to work practicing the skills on the cards. I always have them flip a card and have everyone answer. Then they check the answer key and anyone that was correct rolls and moves their game piece. When they finish work early, it is a great time to go and check out some new books. I only allow them over at the library certain times of the day so they always have to make sure to grab a new book or two to add to their books bins if they are close to finishing all of the books they currently have. Sometimes we are working on a PBL or a big Social Studies project. If they are behind on the project and need time to work on them, that is always a good choice for early finishers too. Hope you found some fresh, new ideas! Let me know if there’s something your early finishers do that should be added to the list! Thanks for reading. Woo hoo! 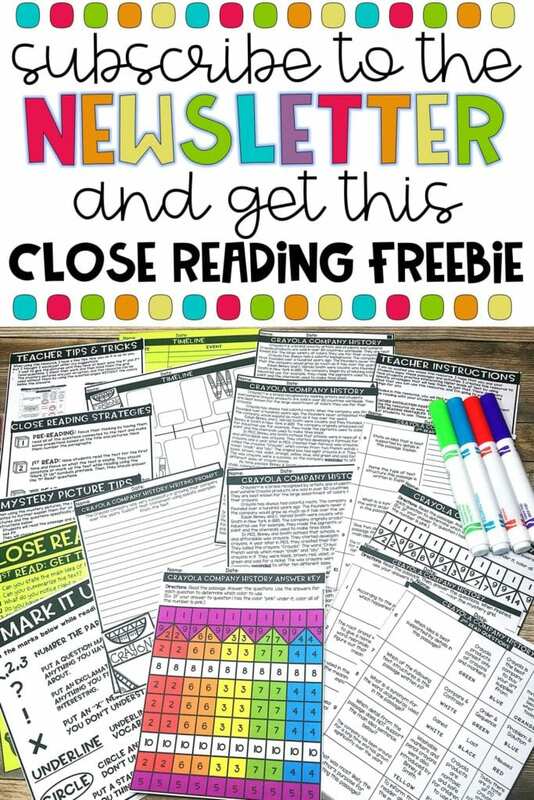 Check your inbox for your freebie! Click here to get freebie.